The new 2016 Discover Lehigh Valley Official Visitors Guide is available to help you plan your next meeting or event in Lehigh Valley! Discover Lehigh Valley&apos;s comprehensive, 68-page visitors guide to exploring Allentown, Bethlehem, and Easton highlights all you need to know. It’s complete with sample itineraries, Stay & Save travel packages, getting to / from as well as around, maps, coupons, and the region’s official calendar of events. Special features highlight what makes the Valley’s three cities the top of your must-visit list this year with Allentown’s massive renaissance, Bethlehem’s 275th anniversary, and the riverside charm of Easton. Connect these with the wide variety of entertainment venues, cultural experiences, sightseeing options, historical sites, and dining choices … and you’ll have an itinerary perfect for spousal activities and team building! Play, Stay, Shop, Eat, and Discover Lehigh Valley with more than 356 Restaurants, Bars, and Things to Do options alone. Browse listings and icons, signifying properties and attractions that have meeting space available and are group-tour friendly and ADA-compliant. 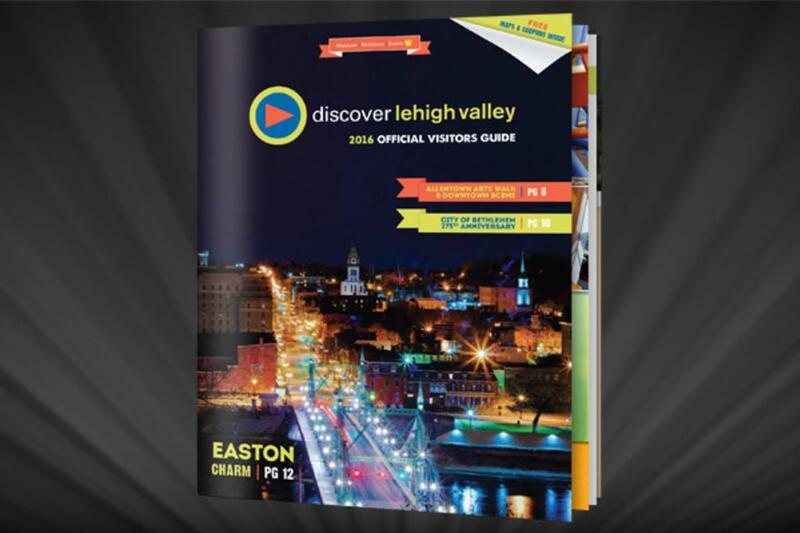 The 2016 Discover Lehigh Valley Official Visitors Guide is complimentary and can be requested by calling 1-800-MEET-HERE or visiting DiscoverLehighValley.com. A downloadable PDF version is available on the site. Plan your Lehigh Valley meeting today.